The picturesque fishing village, Port Isaac, continues to punch above its weight (Doc Martin is filmed here & Nathan Outlaw has two restaurants is the fishing port) with this lovable story of real/reel men, both fishermen and their friends, who made it big singing their heartfelt songs of the sea. The setting is a beautiful port on the rugged North Cornwall coast, where men’s hearts are as true and as strong as Cornish Oak. The yarn, based on true life, centres on ten men whose lives will be turned upside down once ‘discovered’ by a brash A&R man from the big city. Until he arrived they fished by day and sang by night. 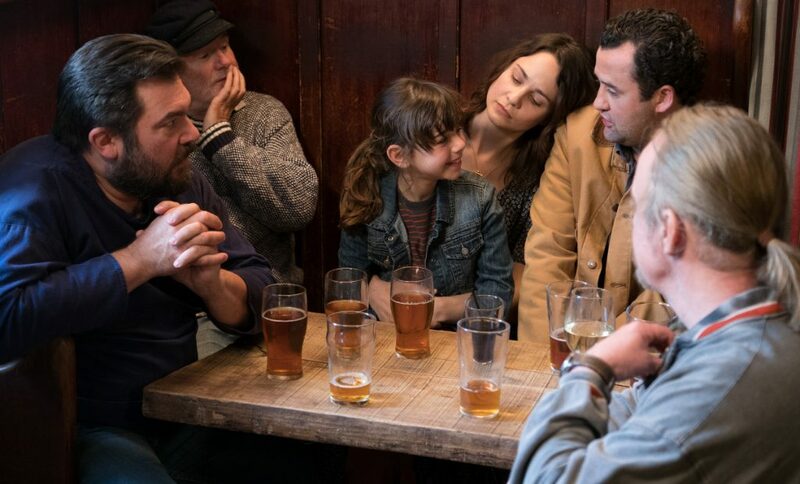 Daniel Mays is excellently cast as the so-called Emmet (a Cornish word for ant, used as a word for visitors to the county…charming!) who ends up protecting a vital landmark of village life. James Purefoy plays the main Fisherman’s Friend with great emotion and fierce protection for his way of life and his daughter (Tuppence Middleton). Other great support is given by Dave Johns (I, Daniel Blake), David Hayman and Maggie Steed, the latter’s deep loss a true moment of grief. 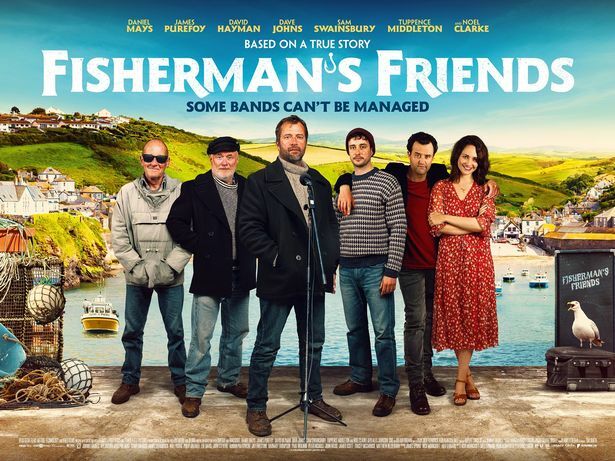 What had started out as a stag-do prank by the recording studio boss (Noel Clarke) and his sidekick (Christian Brassington) becomes a genuine love and respect for the place, its people and the songs that are as beautiful and powerful as the sea which defines them. The real life members of the group also make cameos throughout the film as extras. Expect laughter, tears and to be transported back in time to enjoy the rock and roll of 1752. The great thing is you can see the real life band, in Port Isaac, over summer months and have a pint of Tribute in the Golden Lion, which features as the focal point of the film and village life. Is it cheesy? Yes. Is it formulaic? Yes. But sometimes that is just what you need. Forget politics, forget Brexit and float away with the loveable tail for a couple of hours and let the music wash over you.